Press Gamer is yet another adware program that has been roaming the web recently. 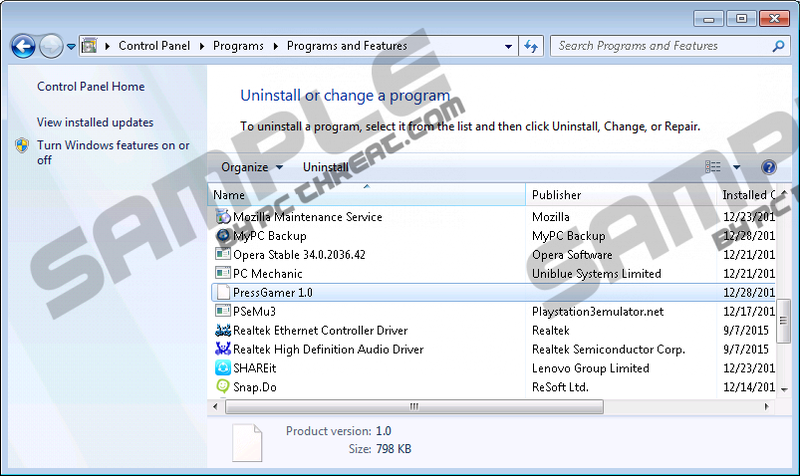 Due to intrusive nature of this program we highly advise you to not delay its complete removal if it is found active on your PC since in some cases it could even turn out to be a major virtual threat. The unfortunate thing is that this ad-supported program is often marketed as a tool that should improve your overall online experience in numerous ways. While such potentially beneficial functionality might make you wish to have it active on your operating system, you must be aware of the fact that such statements are just a manipulative technique used by developers of this adware to trick naive Internet users into obtaining their dubious product without realizing how it really works. In order to understand how this ad-supported program functions and why its complete removal is essential, make sure to read the rest of our report. Below we present a detail removal guide that you should use to delete Press Gamer in just a few easy steps. As soon as Press Gamer enters your operating system it will embed its dubious files and registry entries all over your operating system, which will be used to start a background system service that will be used to contact numerous third-party adware servers. Such connectivity is imperative to the overall functionality of this ad-supported program, as these devious servers are the main providers of unwanted third-party web content, which mostly manifests itself as a commercial third-party ads, pop-ups and coupons. Unfortunately, none of those ads, coupons, or pop-ups are actually useful as they are mostly related to random online dating sites. The most annoying thing about all of this is the fact that by killing the dubious system service which is mostly responsible for the dubious activity might not be enough to regain the default functionality of your web browser. As it turns out this service is set to be launched with each system startup. If you want complete stop all the devious activities of Press Gamer make sure to execute its complete removal without any hesitation. This is your best bet to browse the web without being constantly disrupted; even if just a few leftovers linked to it are active the invasive functionality could continue. What is unfortunate, is the fact that Press Gamer at times could even prove to be rather malicious as some of its dubious web content could turn out to host redirect links. This is a dangerous instance to put it mildly as by clicking on a seemingly harmless ad, you could be taken to a questionable third-party website. The most alarming thing about such functionality is that you could end up on a potentially malicious site without even realizing. For instance, you could end up on a site that might be running an arbitrary code execution exploit meaning that just entering such a site could be much more than enough to get your operating system infected with some unknown malware. In other cases, you could be redirected to a fake online shop, crafted by cyber crooks for one purpose only - to steal your credit card data. It goes without saying that landing on any of these sites could have detrimental outcomes to say the least. Having Press Gamer up and fully running on your computer is a major virtual threat that should not be ignored. If you consider, yourself a security-conscious users, the removal of this adware program should be your utmost priority. It goes without saying that you must not delay the removal procedure of Press Gamer. This is so because, for as long as this adware is running on your personal computer the risk of getting it infected with some devious application is high, to put it mildly. Make sure to follow each step of the procedure carefully since a single mistake could result in an incomplete removal of Press Gamer. You do not want to find yourself in such a situation as just a few traces could have unwanted outcomes. For example, leftover files or registry entries could be used to silently restore this application or could be used for its dubious functionality. To be sure that every single bit of Press Gamer has been removed from your personal computer, we highly recommend analyzing your whole operating system for potential traces associated with this ad-supported application. Select Press Gamer and then click Remove. Quick & tested solution for Press Gamer removal.